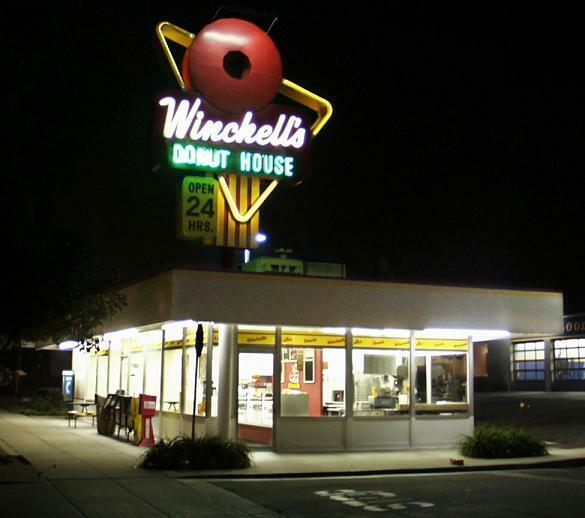 Remember the old Winchell’s Donuts at 887 W. Foothill Blvd. in Upland? What a great sign, and the building was great too. I’m not a big doughnut guy, but I went there a couple of times just for the ambience (and a chocolate raised). It closed in 2004 (the building is now Cherry on Top Frozen Yogurt), but the sign was saved. 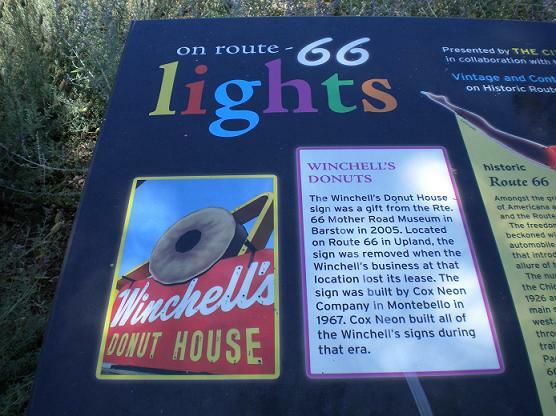 It’s now owned by the Museum of Neon Art and is on public display through January on Santa Monica Boulevard at Martel Avenue in West Hollywood. How about that! See my Friday column for more. Below is the scene from across Santa Monica Boulevard, and below that is a portion of the interpretive panel alongside the sign so we know why we’re supposed to be impressed. This isn’t the most articulate comment I’ve ever left here, but: That sign is awesome! I second Doug Evans’s quasi-articulateness: That is one way cool sign. Also in the “way cool” department is the Museum of Neon Art. I didn’t know anything about this excellent organization until we swung by their display at the LA County Fair (vintage neon 50 feet away from vintage lunch boxes — what more could you ask for, am I right). Vintage neon is “freakin’ awesome”! Really enjoyed the display at the LA County Fair that included another local favorite, the Midway Building Materials neon bricklayer. Very cool!! As a bricklayer with over 37 years in the business, I remember my first day in the trade and meeting my boss for the first time at that Winchells. It was March of ’74 and they were renovating the shopping center behind the Winchells. The house I lived in was right on Route 66 as well in Glendora behind what is now the Knights of Columbus building. And yes, I bought materials at Midway as well when it was open. 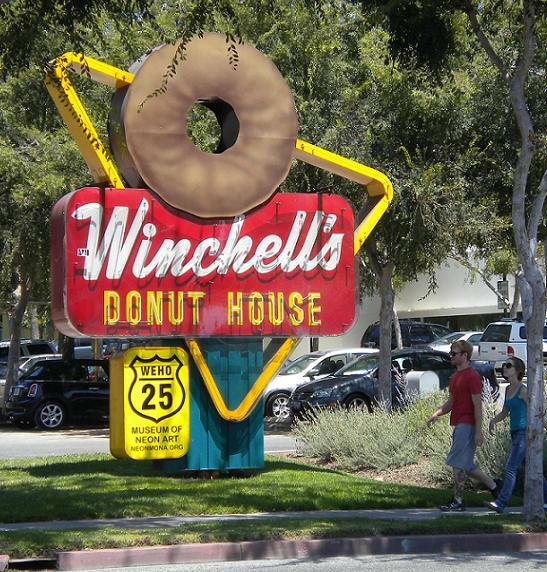 I had the Winchell’s sign on my land for about 5 years before we (MONA) renovated it for the WeHo project, it was my “landmark”! Happy to see it appreciated and it will be nice again as part of MONA’s collection in Glendale. Oh yes, the Midway was and is a gem! I moved to Chino in 1967 when we were married. At that time there was a big do-nut at the corner of Central and Riverside Drive. I don’t know if it was Winchells or if it was neon? ?